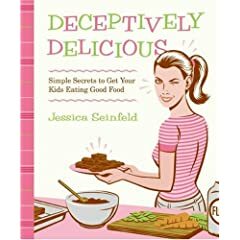 As she wages a personal war against sugars, packaged foods, and other nutritional saboteurs, Seinfeld offers appetizing alternatives for parents who find themselves succumbing to the fastest and easiest–and least healthy–choices available to them. As a mother of three, Jessica Seinfeld can speak for all parents who struggle to feed their kids right and deal nightly with dinnertime fiascos. As she wages a personal war against sugars, packaged foods, and other nutritional saboteurs, she offers appetizing alternatives for parents who find themselves succumbing to the fastest and easiest (and least healthy) choices available to them. Her modus operandi? Her book is filled with traditional recipes that kids love, except they’re stealthily packed with veggies hidden in them so kids don’t even know! With the help of a nutritionist and a professional chef, Seinfeld has developed a month’s worth of meals for kids of all ages that includes, for example, pureed cauliflower in mac and cheese, and kale in spaghetti and meatballs. She also provides revealing and humorous personal anecdotes, tearout shopping guides to help parents zoom through the supermarket, and tips on how to deal with the kid that “must have” the latest sugar bomb cereal. But this book also contains much more than recipes and tips. By solving problems on a practical level for parents, Seinfeld addresses the big picture issues that surround childhood obesity and its longterm (and ruinous) effects on the body. With the help of a prominent nutritionist, her book provides parents with an arsenal of information related to kids’ nutrition so parents understand why it’s important to throw in a little avocado puree into their quesadillas. She discusses the critical importance of portion size, and the specific elements kids simply must have (as opposed to adults) in order to flourish now and in the future: protein, calcium, vitamins, and Omega 3 and 6 fats. Chocolate cake laced with beets, Blueberry Oatmeal bars with carefully hidden spinach, and Pancakes fortified with sweet potatoes are just a few of the crafty recipes in this cookbook inspired by the desire to feed children vegetables without lengthy dinner-time battles. The author, Jessica Seinfeld, is the wife of comedian Jerry Seinfeld. With full-color photographs and nutritional advice.